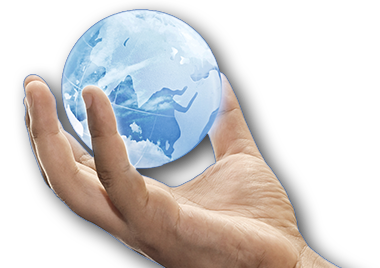 If you have not set up FastTrack Logon or you also need to use Cloud Jobs, you need to generate a client to upload. Even if you have FastTrack Logon set up, it might still be a good idea to generate a client regardless, as people rarely log on to servers and many users more or less never log on and off. But if the primary purpose is to inventory laptops, desktops and tablets, this easy set up is sufficient for most. The rest of this page will go through how to generate an inventory client and how to deploy it. SkyBox is the name of a cloud service that we make available to you through your FastTrack Automation Studio licensing, which you access at www.skyboxinventory.com. There is no additional cost to use SkyBox as long as your executing computers are licensed and within maintenance period. SkyBox consists of two services: Inventory and Jobs. The Inventory service can be used without using Jobs, but not the other way around, because Jobs use inventory data to filter Job executions. The inventory part of SkyBox has its own documentation page here and cloud jobs have their own documentation page here. 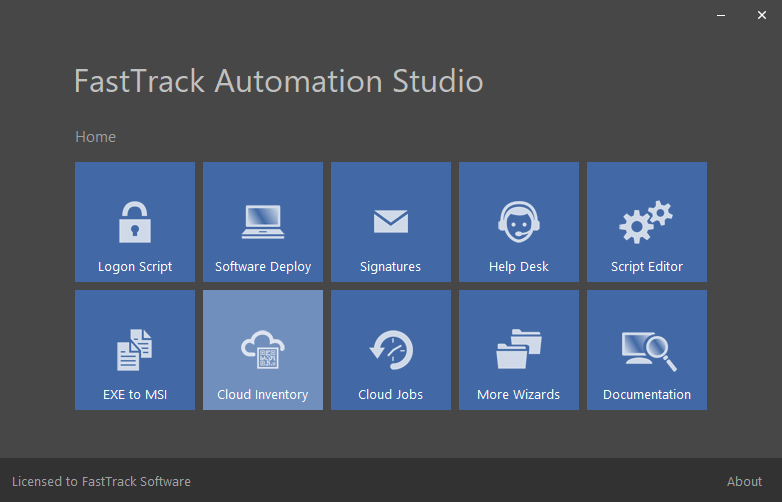 This matrix shows which features are available in which edition of FastTrack Automation Studio. 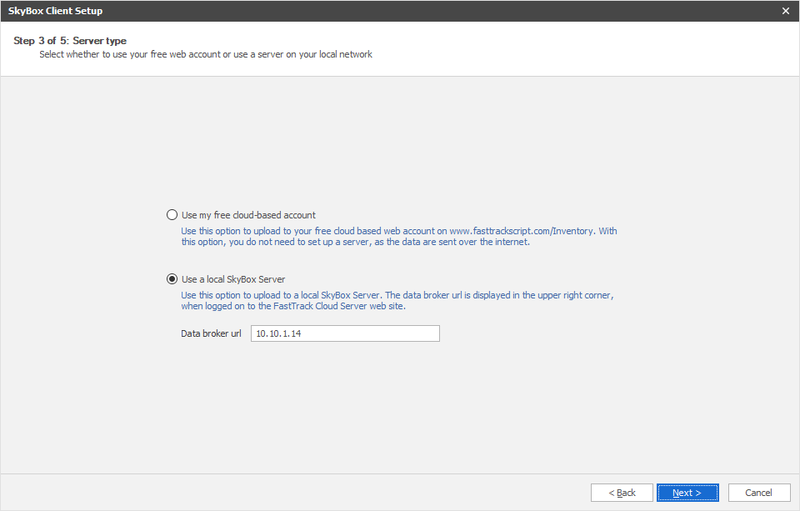 To generate a SkyBox client, go to the Home Screen and click the "Cloud Inventory" menu and click "Build Client". If you are going to deploy with Group Policies, MSI is the favoured method, as this will set up a scheduled task to execute a daily upload. On the next page in the wizard, you need to decide, if the msi or exe file is going to use a cloud-based account or a local inventory server. The next pages in the wizard are used for selecting an output file and a complete screen. Basically what this wizard does is just to build a simple script around the UploadInventory or SaveInventory command and then it uses the exe or msi file generation features of FastTrack Automation Studio to build the output file. When logging on to a Windows XP computer that is under this group policy, it looks like this for a few seconds. 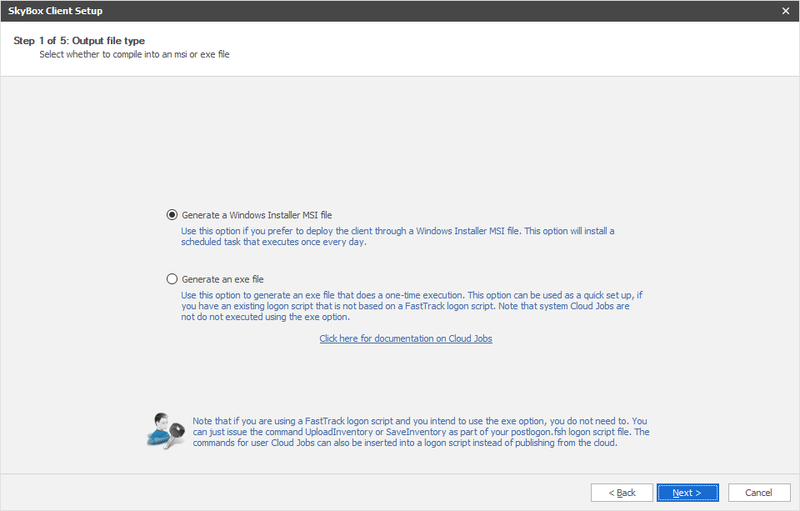 It takes only a few seconds to install, because the MSI file is only 2 megabytes in size. Note that when you deploy an MSI, it will intentionally not do an initial upload on install, because this would cause all computers to upload more or less at the same time. If you need to test that everything works as intended, you can go to the scheduled task list on one or more computers and manually start the scheduled task to verify the data upload, as shown below. 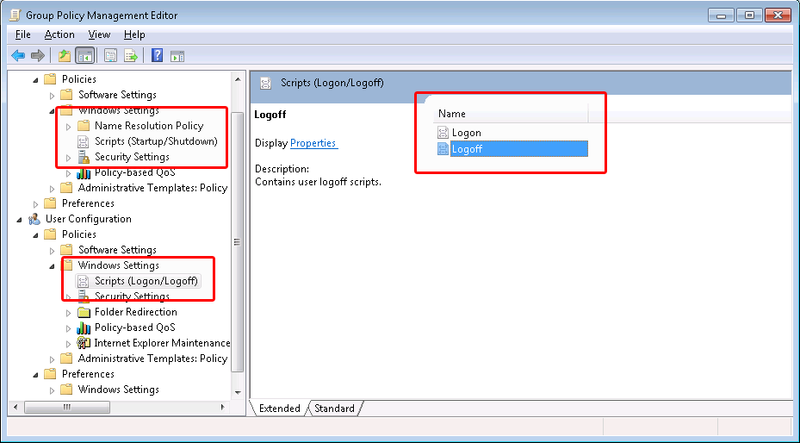 If you are not using FastTrack Logon, one way to upload inventory data is to generate an exe client and simply call it from your current logon script. 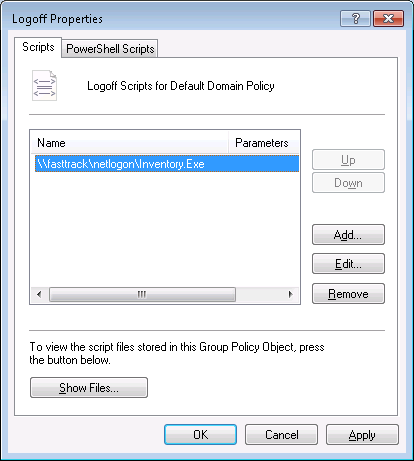 If you called the output file "Inventory.Exe", you could put in the netlogon share and simply execute it from there, as shown below with VBScript. Executing the exe file will normally take about 2 seconds.